In recent years, more parent leaders are discovering that a PA/PTA website is a useful tool to engage parents, provide needed information, and fundraise. There are different options: some PA/PTAs have created a few dedicated pages on the school’s existing website; others have built and support websites that replace the DOE’s school pages, incorporating into them sections for PA/PTA business; and others have decided to build their own site, which often include information from the school, making the PA/PTA site the real go-to site for parents. What type of site you decide on will be based on the specific needs of your parent body, your relationship with your administration, and your capacity. You’ll need to choose a website name (URL), a design platform, and a web host, all of which, again, depend on your needs and capacity. Because of the variability from school to school, we can’t give you precise instructions for how to do it–it would be impossible to cover everything–but thanks to tips we’ve gathered from parent leaders who helped build their PA/PTA websites, we can explain some of the basics and offer a few suggestions for how to begin. If one of your PA/PTA board members knows how to build a website, you are in luck. But if your board members don’t happen to have this skill set, reach out to the school community: maybe a tech-savvy parent will volunteer to create a PA/PTA site. First, you’ll need to choose a domain name–that’s the name or web address (URL) of your website, such as PS123PTA.org. The company that hosts your website (discussed below) will provide this service, or you can register your name separately with a company such as GoDaddy or Namecheap. The fee runs around $10 to $15 a year; if you register with your host, the registration fee is often included in a hosting package. A web host is simply a company that stores your website's pages and makes them available to anyone on the internet. The popular hosts, including WordPress, Weebly, SquareSpace, DreamHost, and Wix, also serve as “content platforms ” — that is, they give you the tools you need to build your site, through a vast menu of well-designed website “themes” or templates to choose from. The hosting platforms all offer several packages, ranging from basic or “starter” to premium or “business.” Most PA/PTAs will probably find that a basic plan will suffice; prices for a simple plan range from free (if you don’t mind ads for the hosting company on your site) to around $150 a year. The deluxe plans, which offer things like more storage, video capability, and more sophisticated e-commerce functions, cost around $220 to $450 a year. You can always start simple and upgrade later if you decide you’d like to add more features. Some hosting companies offer discounts to nonprofit organizations; DreamHost, for example, provides free hosting with proof of your tax-exempt status. So if your PA/PTA is a 501(c)(3) organization, it’s worth checking to see if you can get a deal. Faraji Hannah-Jones, a former PTA co-president at P.S. 307 in Brooklyn, says that he and his school’s web team considered a lot of different platforms; they chose one that they felt offered the best combination of efficient building tools, easy updates, and a reasonable cost. Many PA/PTAs may decide to start with a budget in mind, and see what the options are within that price range. You can always start simple and upgrade later if you decide you’d like to add more features. Each host has its strengths and drawbacks, its fans and detractors. Amy Gropp Forbes, a parent contributor to the Institute for Collaborative Education’s (ICE) website, finds SquareSpace “exceptionally easy to use,” and praised its helpful how-to videos and excellent customer tech support; another parent webmaster we spoke with rejected SquareSpace in part because it seemed too complex for less experienced users. Ultimately what works for your school (and your web design team) may be highly personal. In the Resources section below, you’ll find several articles that lay out detailed comparisons of some of the leading platforms. The hardest part of the process might be deciding which theme best suits your purposes. Once you choose one you like, building your site is essentially a matter of dropping your content — headers, text, photos, etc. — into the layout. It may take a bit of trial and error to figure out how to plug in your material and change various elements (like fonts and colors), but in many cases you can get a couple of basic pages up and running within an hour or two. A statement of your school’s mission. Announcements about PA/PTA meetings and PA/PTA-sponsored events (you can use the same wording as the email blasts you send). Names and email addresses of each PA/PTA board member. Some PA/PTAs include photos of executive board members so other parents will be able to recognize who’s who and be able to approach them. A way for parents to sign up to volunteer and a way for them to donate money. Links to the forms parents must fill out at the beginning of the year (contact cards, school lunch forms). Quotes and stories about what makes the school special. The Bard High School Early College Manhattan's PTA website features Student Stories — short videos of students talking about their experience at Bard (a favorite class, a rewarding paper or project). You could also post brief quotes from students, with photos rather than videos. Highlight some of the activities that the PA/PTA helps fund: images of student artwork if the PA/PTA pays the art teacher’s salary; if the PA/PTA funds a chess program, add a photo of the chess team at a tournament. 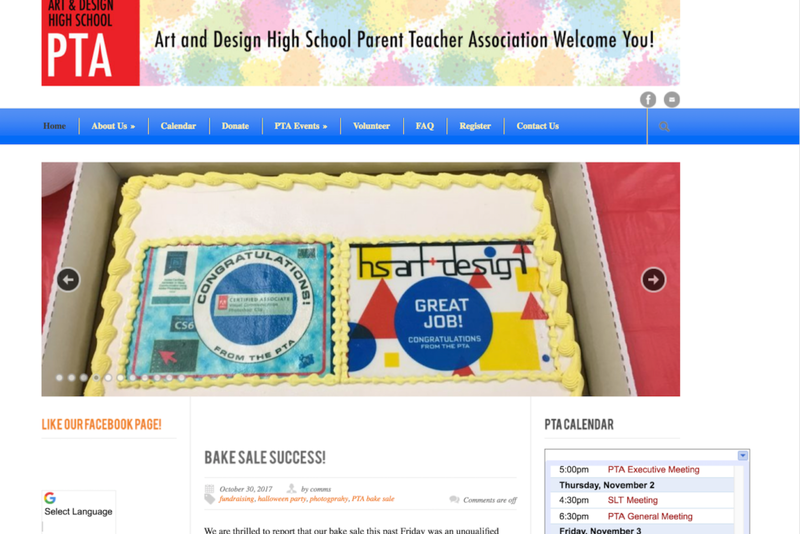 If your school has a website (other than the DOE site), you may want to create a similar look for the PA/PTA site — use the same typeface, for example, and the same colors for the banner or other design elements. If your site builder isn’t super experienced, don’t try to make the site too complicated. Start simple — with a page for announcements and a page for donations, for example. (See if you can embed a button that takes you straight to Paypal, to make online donations easy.) Keep in mind that websites can continue to grow after they’ve gone live. As you get more comfortable managing the site, you can get more ambitious and add more pages. Try not to load up the pages with too much text, or too many sidebars. Maintain plenty of “breathing room” on the page — keeping some space between blocks of texts, and adding images, will make the site more readable. You might want to stick with simple, sans serif fonts, which are clean-looking and easy to read. And use photos, which always make a site feel inviting and lively. Part of your planning process should include making sure you have someone who will be responsible for adding updates. A neglected website, where the latest notices are months old, is a sad thing to behold. Maybe your web builder is willing to be the point person on this; or she can easily teach someone else how to plug in new material. Perhaps someone else can take charge of collecting photos to add — from field trips, sports games, etc. An update plan is critical. If all this seems daunting, you can get professional, free assistance in designing your PA/PTA website. Taproot+ — a program of the Taproot Foundation — is an online matchmaking platform that connects nonprofits with professionals skilled in information technology (as well as marketing, IT, HR, business strategy, and finance) who share their expertise pro bono. If your PA/PTA would like to be paired with a Taproot+ skilled volunteer, or would like more information, we’ll connect you with Taproot+. Just send us an email at [email protected], including “website” in the subject heading, and let us know your needs. Taproot+, a program of the Taproot Foundation, is an online matchmaking platform that connects nonprofits with professionals skilled in information technology (as well as marketing, IT, HR, business strategy, and finance) who share their expertise pro bono. The article, "Weebly vs Wix vs SquareSpace vs WordPress" discusses the pros and cons of each of the four web building platforms. "We Created a Site in Wix, Weebly, Squarespace & WordPress – See How Each Stacks Up" compares the four website creation tools listed in the title. This article, entitled, "Wix vs Weebly vs Squarepace vs Jimdo - Top 3 Pros & Cons in 2017" gives insight into the attributes of each web-builder. This blog piece, "Wix vs SquareSpace vs Virb vs Weebly vs Jimdo vs WordPress Theme Builders" examines the differences between the referenced website building tools.